We are happy to announce that we have successfully showcased 28 Australian Startups in IT/Media/Telecom/eCommerce/Social Networking/Marketing/News/SAAS. We also covered 3 surprise entries which missed the competition by a whisker in registering for the carnival with extended dates :-). This carnival was possible because of all the participants who participated, our elite panel of Judges who have put lot of time, effort and energy from their personal time with shear passion to mark all the participants. Our sincere thanks goes to Judges and all the participants. We would like to thank our sponsors, CeBIT Australia 2008, which is our major sponsor, Smart Path, Cagora, and BuiltWith. Without their support its very hard to keep going a long way. We do appreciate and thanks them for their encouragement and participation. 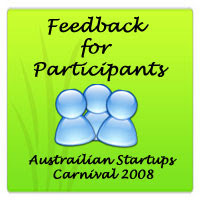 Each category was judged and commented by Judges and then final comments/feedback was added. Each Judge marked each participant on a scale of 1 to 10, with higher the number, higher the relevance. After each Judge marked them individually on a scale of 1 to 10, we took the average and prepared the final results. Final results will be published tomrrow. Today we are only sharing these final comments by judges, as a feedback, with all of you. We are not disclosing the comments given under each category. We will be compiling those comments in a separate post here or can be sent to you directly if requested. The final comments/feedback given is in order of participants being showcased. A pdf of this feedback can be downloaded from here. The consumer site can still get more traction. Do a relaunch, reach out to bloggers again, work on partnerships with entertainment sites etc. Create a white label that can be embedded into online news sites. Keep pushing it! Work hard on the value proposition and aim to trade sale to one of the big real estate sites. To get attention for the site, it's worth considering a free automated pricing systems, as Zillow has. The basic business can stay the paid reports, but the automated system will generate traffic and media attention. Done a good job in developing an intelligent approach to filtering news, and also makes articles a bit easier to get a grip of. Couple of problems in logging in and also on multiple occasions advised me that I have already read the entire internet. There also isn't any selectivity immediately obviously available by country, nor focus/refinement by news source. Marketability is uncertain - who will buy it? And defensibility - any major eg Yahoo, Google etc can apply resources to recreate the same type of approach. Nice layout but the key to great aggregation is up to date content. The site was a day old when I checked it, and wasn't aggregating the latest (and big) stories. The search function is very slow and needs to be improved - people don't have that much patience. Other than that it's a great space to be in, so put energy in. Make it as easy as possible to get started with the site so you get critical mass with participants. The site needs a redesign to look at lot more professional. There are a range of monetisation mechanisms possible here, including exploring referrals to realestate agents. Unoriginal idea that could be easily put together with some Magpie and a WP tweak. Great site revamp recently. It is time to carefully consider taking this to other countries. There may be ways of monetising some of the company monitor features. One of the most important things is broadening your sources, and if necessary paying for partial feeds in order to get more complete coverage. Looks like a solid product and marketing strategy. Need to be clear whether prices are US$ or A$ and otherwise clarify the positioning in different country markets. Still has some useability issues with the maps etc. Needs a redesign. The front page includes 'popular' and 'recently added' surf sites with no indication of how they're organised (popularity? recency? continent? currently daylight?) making them close to unuseable. Highly centered on providing home surf forecasts, while many will be interested to look at what's happening in other locations globally. You may want to reconsider your pricing tiers, for example make them based on numbers of invoices. Need clarity on your intended users, and in particular their degree of tech sophistication. Be aware that not many people with the tech nous to use this (the way it is presented) use docx. I like buzka but it's a difficult space to be in. Not clear whether Buzka.com or Popnets is the submission here - there isn't enough information on Popnets to judge it, though the overt positioning is interesting. Buzka has a very slow load time. The front page doesn't do justice to what is contained within the site. The site concept needs greater clarity for first-time visitors. CRM plus CMS and website. Nothing new in this -but they have done it really well. I don't want to provide a mark for this as all we have is a concept but given the inventors not wishing to disclose at this time we have no specifics to evaluate it on. There is no question that carbon / green market opportunities abound but I get very concerned about greenwashing, that is, taking the approach that I can buy a Hummer as long as I buy a carbon credit alongside it. A very cynical market will kill initiatives that are for the wrong reasons. That said, if someone HAS to fly, and they can select a choice that puts part of their spend into renewables, then that is a good thing. The challenge with this venture is turning a quid - and perhaps if you set it up as a non-profit venture you might get the serious traction you are looking for. I think we will see a trend towards all companies contributing to the environment and therefore eventually bringing carbon neutral to carbon offset neutral in the same way that frequent flier points became undifferentiated as all airlines were offering it. The principle is interesting, but there is nothing else to judge at this point. I question whether people will want to have the airfare and carbon offset bundled. It will be challenging to provide an equivalent access and quality of the established online travel sites. This site may make more sense for people to buy their own carbon offsets for travel booked elsewhere. But I could be wrong and this might work on a small scale. Nick gimmick, but should this be in the competition? While it has some traffic, it is still far from reaching critical mass. One step is to make it more user-friendly for non-registered users. e.g. the search function requires a difficult CAPTCHA, which will result in people leaving the site - there's no need to protect search in this way. This application tries to bring together a range of blogging, clipping, social networking apps into one. As a result it does none of them brilliantly. Because it covers many content areas it is diffuse and is less likely to attract users with specific interests: celebrities, videos etc. It may be better to focus on one area/ target market before broadening - this is more likely to attract enthusiasts. This is a really immediately useful application that provides neat preview and categorisation of videos - it puts me in control to scan quickly items of interest plus add my own. this should appeal to those who are interested in creating content and reviewing other content. Where is the monetisation? Perhaps similar to utube in building and audience and seeking trade sale. An issue is dependence on utube as underlying technology - should utube change their model for aggregators, life will be very interesting! Well resolved..
has it's moments. tough vertical and tech didn't impress me. There is still real scope for this to become a hot consumer site. Perhaps a relaunch and/or a concerted blog campaign could help this to pick up visibility, which will support the business services side of the business. Sorry, this appears to all intents to be a service business and one without a compelling proposition. For mine it doesn't meet the criteria for application. Is there a product here? There is an opportunity to differentiate a primarily services-based business with online services, particularly free ones which will lead to consulting or education engagements. I think this is a great concept that ties into the inherent need to tell people about good service. So what happens when service is lousy? Have the owners considered the legal issues of publicising negative comments? It is difficult to find businesses that have been rated - at this it looks closer to yellow pages online, albeit done better, than a good ratings site. These guys would do well to study Choice. The platform seems solid but it needs users. Perhaps focus on or promote it to a niche such as auto repairs or natural health - areas where people definitely want recommendations. At the moment because it is so broad, people will usually find no reviews. This will not get any critical mass as it stands - there is little incentive to join as you can't see anything about the network, and it strongly limits the value to non-paying users. Given the strong value available on the many completely free social networks, the only way this just might go anywhere is to be far more open, and monetise later. Looks like an aggregated blog. Hard to see how that will be unique or defensible as a proposition. YAY! a Pligg run site. 0 across the board, millions of Digg voting sites out there, I see absolutely nothing in this one. There are hundreds of Digg copies out there. There needs to be something more compelling than just doing that for Australian content - some kind of spin or twist that will generate interest. Hitting back doesn't take me back to what I was looking at. Swop library the old fashioned way. Potential to drive online movie purchase, but due to distribution by post, it becomes interesting. Ever lent someone a book? Not easy to chase up and get it back. I'm not even sure what this is suppose to be, something between delicious and myspace? Site was throwing up SQL errors, if they can even get the basics right. When I was at kmp, our team did something similar in the UK, with govt development backing. There is a need for sports clubs to have an easy way to share content ( by coincidence I am developing a site for our junior football club now) - but what is here is very limited in its approach for anything other than small teams. It's not original, however first time I've seen a local site like this. The strength is in the whitelabel provision like their deal with Prime. Not a brilliant service, but one that may well have a decent future. The strong focus is one of the real strenths of 3eep. Tieing in with sports sponsorships, especially with local businesses such as credit unions, can be a very powerful model. The differentiated platform offers many possibilities for marketing into verticals beyond sports. I am sorry these guys have put so much time and sweat and cash into this, and I do hope they prove me wrong - but this just doesn't look like a model that will fly. Bearing in mind that they are discussing a new product, which I assume is not Cagora.com. A business model of sharing advertising revenue without having to worry about how that occurs is interesting and new, but if the new product is based on Cagora, it lacks content, and doesn't looking compelling to find or add content to. If their product is different the challenge here is having something to review in order to mark it effectively. That said, the writeup provided with this submission was the most articulate of all of them. It is very hard to see the organising concept behind the current site, making it confusing and hard to navigate. It would be better pared back to a far simpler interface with far clearer value for visitors. The NFP community model has been proven to work - when done very well - in the US. Puts SMS campaigns into the hands of those people who want to use them. Not sure that I can see anything around avoiding sms spam. This looks like a solid offering. This could be bundled with other marketing/ social network offerings through partnerships. A great idea for young creatives to get notice, to create viral campaigns and let the community do the grass roots marketing. Taking a step further, sponsorships by AFA AdSchool / ad industry / movie makers etc - could be a neat hunting place for talent. I like it. Failed idea from the US, no reason to think it will work here. While not highly original, there is a solid business model and the simplicity of the approach will help. The key issue is building critical mass. Partnering with industry associations and offering subsidised deals to lead clients could help bring momentum, along with the usual online promotion techniques. I don't get this. If this is meant to be scientific, the sampling certainly wont be. Interestingly novel idea, and could be one to launch either a book / blog / body of research from. Cute, but I'd question its inclusion here. Nice! A lovely reflexive idea. Chances are it won't take off, but if you can get some traction it just might go a long way. If this doesn't work, try it again under a slightly different guise. Do what you can in blog promotion, and it's definitely worth advertising on Facebook. Watch out classified adverts, here is the new model. Incorporates freecycling as an idea, and I think we will see the ebay shop model moving across to this as well. Good job. The only thing being recycled is the idea. Work on the simplicity and look and feel. I'm personally not keen on how it looks - it doesn't seem contemporary or sophisticated. Pull back on the ads and over-prominent self-promotion - they clutter the site and can in fact make it seem less well established. That said, a great concept which could go a long way with massive determination and some luck. For people to use. Loads of viral opportunities, lots of opportunities to contribute and various spin offs of the technology. No wonder they are doing well, well done! A really nice implementation. The license program is good - I presume this provides white-label sites. There is a lot of potential to get media coverage for this - it sounds like you've done this already. Offline marketing will certainly be very important - the right blogs will also be good to promote to. There is definitely good upside for this. This is a biased opinion, but I had looked at 88Miles in depth prior to this competition and evaluated it as the best timesheet system for a multi-user business. Really good value, and I am planning we will adopt it for our business. A niche market done well. The web service is definitely good to promote. While you are targeting a specific area now, there is the potential to build related applications to provide a very simple Professional Services Automation (PSA) suite. This has only recently become a major sector in enterprise software, but there are extremely limited offerings for smaller companies (and a rapidly growing market as many professionals go independent). Many thanks for the useful feedback on Me2mobile. We wanted to add a point in response to one of the judges comments. Me2mobile has a built in protection against spammers. Unless a user actually texts in to use the service first, a Content Provider cannot sending premium SMS to the user. This prevents spammers abusing the service. In addition, our T&Cs have a strict 'one-strike and youre out' policy. Its easy to figure out on yr own who gave which feedback if you read it carefully :). I can ask the judges if they are happy to disclose who gave which comments. Thanks for the feedback. It is helpful advice. I have no idea what makes a site web 2.0. Social network sites to me are basically forums with some added features. It would be interesting to do a follow up post next year to see how all of the sites are going.